The Panama Canal is an engineering masterpiece that connects the Atlantic and Pacific oceans. Partial transits typically sail round-trip from Florida ports. 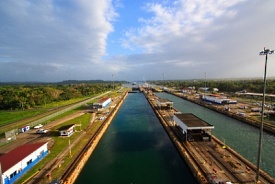 The ship will enter the first set of locks, then turn around in Gatun Lake and exit the canal the way it entered. Partial transits give you a sampling of the workings of the Panama Canal, but in less time than a full canal transit.